According to recent grid requirements, wind farms must adapt to transient disturbances as quickly as possible, while keeping grid-connected wind farms operational during disturbances in the power network. A new control strategy for Doubly Fed Induction Generator (DFIG) considers a Current Controlled Voltage Source Converter (CC-VSC), which has fewer intricacies in the converter design (DC-link, chopper circuitry and reduced Proportional Integral Controller were not investigated). Parallel interleaved voltage source power converters for the DFIG. It was discovered that the proposed CC-VSC based DFIG control offers better performance of the wind turbine variables during transient period and is therefore more economical, since it does not require external circuitry. 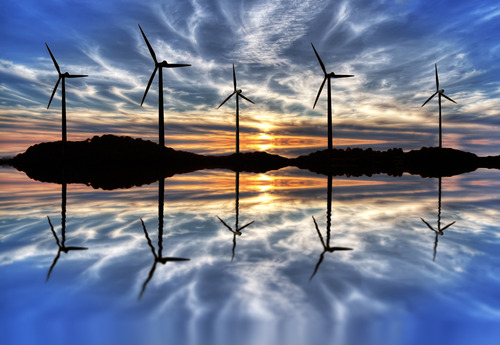 The Current Controlled Voltage Source Converter DFIG topology offers a cheap and effective way of enhancing the performance of grid-connected wind farms based on the recent grid requirements. Wind turbine developers could design this proposed Current Controlled DFIG wind turbine power converter scheme to keep the wind farms grid connected during fault conditions. This control strategy could also help keep obsolete fixed speed wind turbines in operation by developing wind farms that are composed of fixed and variable speed wind turbines. Instead of phasing out fixed wind turbines, they could be operated in parallel with the DFIGs variable speed wind turbines, thus using some of the characteristics of the fixed speed wind turbines (such as robustness and low maintenance cost). Collaboration with academics and wind turbine developers. Benefits and weak points of various control strategies in enhancing variable speed wind turbine transient performance (Click here for full text access to the Paper).